3 trees planted in memory of Moises Salas, Sr. Celebrating the life of Moises Salas, Sr.
Be the first to share your favorite memory, photo or story of Moises. This memorial page is dedicated for family, friends and future generations to celebrate the life of their loved one. Obituary for Moises Salas, Sr. In loving memory of Moises M. Salas, Sr.
Moises is survived by his wife of 60 yrs, Polycarpia (Paula) Salas, his beloved children; Leticia (Sam) Chapa, Cynthia (Joe) Hunter, Matilda Salas, Hector (Diana) Salas and Jessica Salas (Jason O’Neal), 15 Grandchildren, 14 Great Grandchildren and 1 Great great Grandchild. Also by his siblings Paul, Manuel and Eligia Salas, Geronima Davila and many nieces and nephews. Moises is preceded in death by his parents, Gabina and Gregorio Salas, his siblings, Celestino and Domingo Salas and Petra Guerra, his son, Moises M. Salas, Jr. and great-grandson, Simon Peter Hamilton. 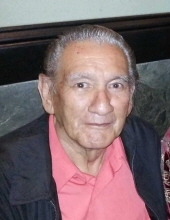 Moises was born on September 4, 1937 in McNeil, TX to Gabina and Gregorio Salas. He married his wife, Polycarpia (Paula), on May 28, 1958 in Seguin, Texas. For over 40 years, Moises owned and operated his upholstery shop from his home in Luling, TX, where he and his family resided for the majority and remainder of his life. He transitioned peacefully to his Heavenly Home at his residence on March 16, 2019 at 2:35 am, surrounded by his loved ones. Rosary is to be held on Thursday, March 21, 2019 at Thomason Funeral Home in Lockhart, TX at 7 pm and Burial Mass on Friday, March 22, 2019 at 10 am at St. Johns Catholic Church in Luling, TX. Arrangements by Thomason Funeral Home – Lockhart, TX Address - 2220 S. Colorado St (Hwy 183 South) Lockhart, TX 78644. To plant a tree in memory of Moises Salas, Sr., please visit our Tribute Store. "Email Address" would like to share the life celebration of Moises Salas, Sr.. Click on the "link" to go to share a favorite memory or leave a condolence message for the family.